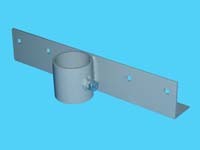 Dock Hardware | Dock Hardware for 2" Pipe | VE-VE Inc.
Home :: POST Dock Brackets ( #5 ) :: ( #3 ) "POST DOCK BRACKETS" For 2" dock pipe ( 2-3/8" O.D. ). 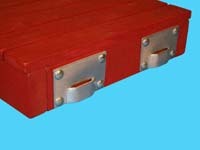 D-500 Series; "POST DOCK BRACKETS" For 2" dock pipe ( 2-3/8" O.D. ).pipe. The "Straight Bracket" features an angle iron dock mount with an adjustable sleeve for fastening 2" dock pipe to side of dock section. Usually used 2-4 ea. per dock section. ( 1/2" adjustment bolt included ). 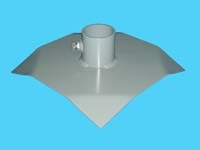 The D-557; "Rectangular Backing Plate" can be used with the D-556; "Straight Bracket" as a back up plate on inside of dock section to add more bracket mounting support. 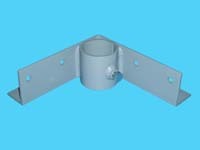 D-560; "Right Outside Corner Bracket" ( For 2" pipe. 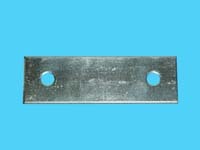 ( 2-3/8" O.D. )). The "Right Outside Corner Bracket" has a 90 degree formed angle iron dock mount ( ties end corner together giving added support ) with adjustable sleeve for fastening 2" dock pipe to dock section. 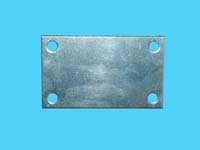 D-565; "Left Outside Corner Bracket" ( For 2" pipe. ( 2-3/8" O.D. )). The "Left Outside Corner Bracket" has a 90 degree formed angle iron dock mount ( ties end corner together giving added support ) with adjustable sleeve for fastening 2" dock pipe to dock section. 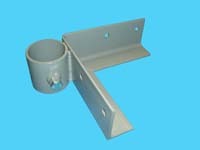 D-566; "Inside Corner Bracket" ( For 2" pipe. ( 2-3/8" O.D. )). 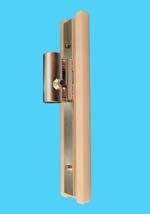 The "Inside Corner Bracket" has a angle iron dock mount with adjustable sleeve for fastening 2" dock pipe to dock sections. Used in corners for dual section support or inside (underneath dock) of outside corners to make outside of dock free of dock support pipes. The D-562; "Rectangular Backing Plate" can be used with the D-560 & D-565 "O.S. Corner Brackets" as a back up plate on inside of dock section or the D-566; "I.S. Corner Bracket on the outside of dock to add more bracket mounting support. ( 2 ea. per Bracket ). D-526; 12" Sq. "Base Pad" ( For 2" pipe. ( 2-3/8" O.D. )). The "Base Pad" has a 12" square base and adjustable sleeve to mount 2" Pipe ( 1/2" adjustment bolt included ). Hole in center of pad allows pipe to go through for extra dock support if desired. Usually used 2-4 ea. per dock section. 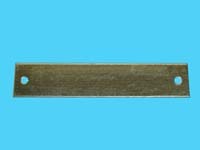 D-556-L; "Straight Bracket / Section Connector" ( For 2" Pipe. 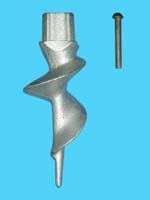 ( 2-3/8" O.D.)). The "Straight Brkt. / Section Conn." has a angle iron dock mount with adj. 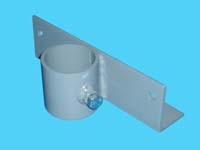 sleeve for fastening 2" pipe to dock. Usually used 2 ea. 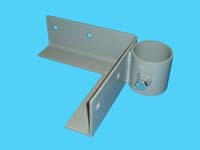 per connection joint for dock support and connecting dock sections together ( 1/2" adj. bolt included ). D-548; 2' "Bumper Mount" ( For 2" pipe. ( 2-3/8" O.D. )). 2' "Bumper Mounts" are made to slip over the top of your existing ( 2" ) dock posts and mount a Carpeted Wood or Polyethylene Bumper. 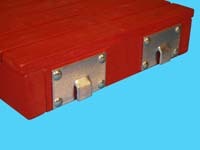 NOTE: Shown with optional D-542; "Polyethylene Bumper", bumper pictured below. The D-506; "Sand Auger" ( For 2" Sch. 40 Pipe, ( 2-1/16" Inside diameter )), mounts in the inside of the dock pipe and stabilizes it firmly to the lake bottom for added dock stability and support. These are not the lightweight / breakable Aluminum ones, these are made of Solid Cast Iron, weighing over 4 lbs. each.